From a steady horizontal flight, the aircraft gradually pulls up its nose and starts climbing at an angle of approximately 45 degrees. This "injection" phase lasts for about 20 seconds, during which the aircraft experiences an acceleration of around 1.8 times the gravity level at the surface of the Earth, i.e. 1.8 g. The engine thrust is then reduced to the minimum required to compensate for air-drag, and the aircraft then follows a free-fall ballistic trajectory, i.e. a parabola, lasting approximately 20 seconds, during which weightlessness is achieved. At the end of this period, the aircraft must pull out of the parabolic arc, a manoeuvre which gives rise to another 20 second period of 1.8 g on the aircraft, after which it returns to normal level flight attitude. These manoeuvres are flown repeatedly, with a period of 3 minutes between the start of two consecutive parabolas, i.e. 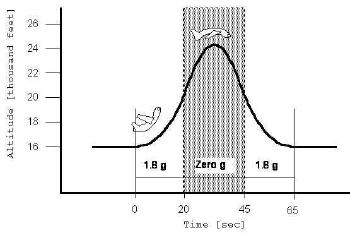 a 1 minute parabolic phase (20 seconds at 1.8g + 20 seconds of weightlessness + 20 seconds at 1.8g), followed by a 2 minute "rest" period at 1g. After parabolas 10 and 20 however, the rest interval is increased to 6 minutes. Throughout the flight, all personnel is kept continuously informed of the campaign status, i.e. indication of how many seconds to the next parabola, number of minutes of rest period, etc. Text excerpt from www.spaceflight.esa.int. Sketch by Novespace.